The Secret Garden is located in Abbot Woods on the campus of SHED Children’s Campus, a nonprofit offering Reggio Emilia inspired children's programs. Since 1997, SHED Children's Campus has made its home on a portion of the grounds of the former Abbot Academy — a private girls school, founded in 1829 and merged with Phillips Academy in 1973. On the south side of SHED Children's Campus, the Secret Garden lies at the end of a path running through Abbot Woods. Hidden within a dense grove of rhododendrons, a clearing reveals a plaque mounted on a rock and a small round reflecting pool. Etched into the plaque is a poem by famous poet T.S. Eliot, who had a relationship with Abbot Academy drama teacher Emily Hale. 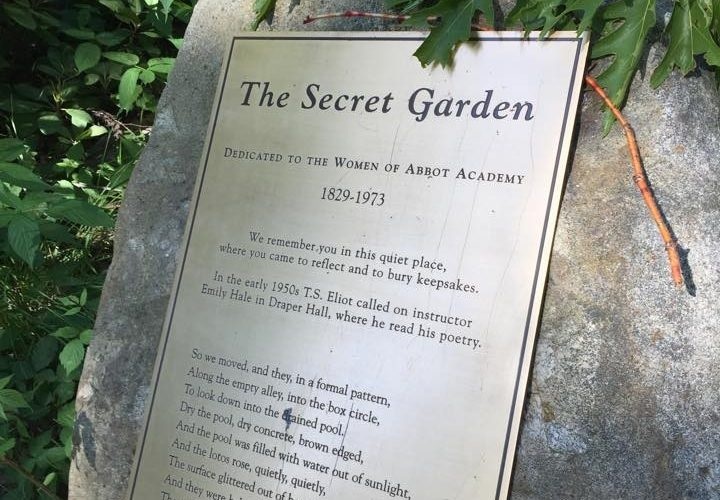 The plaque memorializes Abbot Academy's rich, 150-plus year history and all those who walked through its halls and the path to The Secret Garden — We remember you in this quiet place, where you came to reflect and to bury keepsakes.